Leh Ladakh in February, even the very idea sounds Intriguing and adventurous. But make no mistake, a trip here at this time of the year is not everyone’s cup of tea. Life in Ladakh in winter is harsh; so harsh that even the locals move to other parts of the country for a few months and return only after winter has passed. If you want to visit Ladakh in February then there are several things you would need to keep in mind and prepare yourself for; both physically and mentally. How can you plan this trip for the best and to avoid hassles is what I will be talking about in this post. Until 10 years ago, Ladakh was visited only by a handful few. It was either the adventurous biker lot that used to plan a trip here; or the foreigners. Much however has changed lately. Ladakh has now turned into one of the most desired destinations of our country; and places like Nubra Valley and Pangong Tso are becoming a household name. Now you will also find families vacationing here with children and elders. It is no longer only the place for adventure junkies and motorcycle enthusiasts but also for honeymooning couples. The boost in tourism is visible throughout the year. You will now find tourists here even in the months of January and February and the numbers increases by each passing year. So if you were wondering whether you can or not plan a trip to Ladakh in February then the answer is a definite yes. Should you do so or not however is an entirely different matter; which I suggest you decide on after going through the information below. I will break this article in three parts. First I will mention a few key points that you must remember while planning this trip. Then I will suggest an example of an itinerary that you can follow. In the end, I will finish the article with a few advantages and disadvantages of traveling to Leh Ladakh in the month of February. Why Visit Ladakh in February? The first question that comes to mind is why anyone would want to visit Ladakh in such extreme weather? Normally people would like to wait it out until summer has arrived and life is back to normal. There can be but just two reasons to it. The first and probably the biggest reason is of snow. A winter trip to Ladakh guarantees that you will see plenty of snow and may even catch a live snowfall. I agree that there are other hill stations in our country where you may witness the same but not like the way it is in Ladakh. Entire valleys buried under several feet of snow is a sight available at only a handful of places in our country and Ladakh is one among those. The second reason is of adventure. A trip to Ladakh will always have an angle of adventure to it which increases even further if you went there during peak winter. Harsh weather, freezing temperatures, tough living conditions, only a handful of people around, slippery risky roads and unpredictable roads; these are circumstances that anyone with even slightest of interest in adventure would really crave for. Tourism in Ladakh is on boost and everyone seems to be going in that direction these days anyway. So yes, now a lot many can say that they have been to Ladakh and seen it all. But how many can say that they have been there during peak winter? You do that and you have something to boast about. You will have images and stories that will leave people around you envious. Can we visit Ladakh in February? A straight answer to this question is that yes you can. I would not however recommend it as your first trip to Ladakh. A winter trip is best as your second or probably third time here. But if you have never been to Ladakh then I would recommend that you postpone the plan by a few months; and undertake this journey between May and September. That way you would have already familiarized yourself with the region. You would know where to go, where to stay, what to see and what to expect. You would know what the terrain of Ladakh and its climate is all about; before you come here in extreme weather conditions of February. Can you visit Ladakh by road in February? The answer is an immediate no. The only way to reach Ladakh in the month of February is by Air. Both the roads connecting the region to rest of the country will not be accessible at this time. You will have to fly in and out of Leh city; and the only road you will hit in this journey are the internal ones within Ladakh. Once you arrive in Leh, you can then hire a taxi for local sightseeing to places like Nubra Valley and Pangong Tso. No you cannot travel from Manali to Leh in February. At this time, Rohtang pass remains completely snowed out and opens sometime in April at earliest. So starting from Manali, the farthest you will go is as far as Gulaba check post. Apart from Rohtang, other passes en route like Baralacha La too remain closed; so if by some miracle you made it to Lahaul valley across Rohtang, you will not be able to go any further. The earliest you can plan a trip on Manali Leh highway is either towards Late May or early June. Also Read: How to Plan a Journey on Manali Leh Highway? Like Manali Leh road, this highway too remains completely blocked; and you cannot travel from Srinagar to Leh in February by road. Even Sonamarg at this time is inaccessible. Starting from Srinagar, you will probably get only as far as Kangan or a little after that. 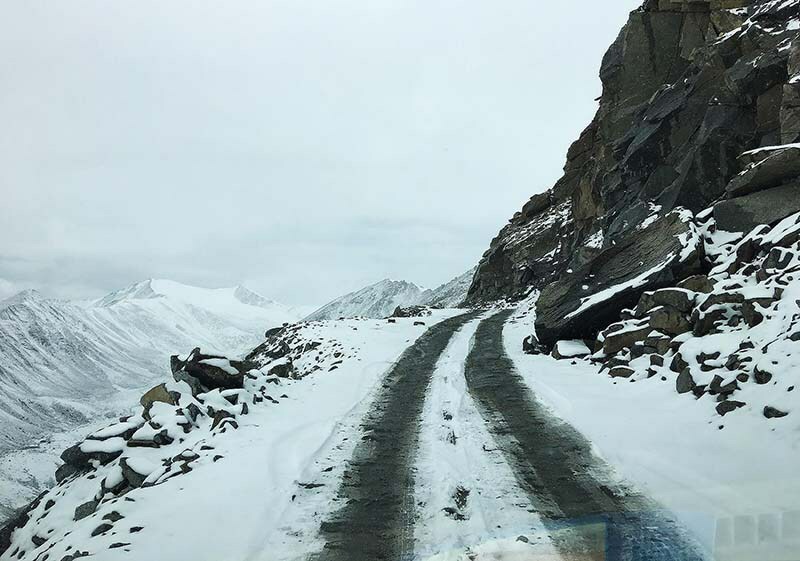 Zoji La, the most treacherous stretch on the entire highway, is buried under several feet of snow and there is no way you are going to cross it. The earliest you can hope for this road to open is sometimes towards mid-April, not before that. From Leh side however, the road remains open all the way till Kargil. Which then leaves you with only one choice in terms of reaching Ladakh; to catch a direct flight to Leh City. Once you have landed in Leh city, your first concern would be of finding a place to stay. There are three things you will have to think about; your stay in Leh City, your stay in other areas of Ladakh; and should you book in advance. I am myself not a fan of advance booking no matter where I go. I like to arrive at destination first, look for a hotel per my taste and negotiate an on the spot deal. But this is really a choice when options are in ample; which as you realize is not the case when you are in Ladakh in February. At this time, most of the hotels remain closed and non-functional. Only a few remain open in which case I would strongly suggest that you book in advance. Not only this would avoid any last minute hassles for you and save you the trouble of hotel hunting in freezing temperatures; but it would also give some time to your host to prepare for your arrival. So does it mean that you will not get any hotels in Leh if you didn’t book? Quite the contrary actually. Even if you did not have a prior booking, you will still be able to find a hotel easily even in dead of winter. You will just have to walk around and search a bit. These days, as more and more people arrive in Ladakh in winter, a few locals have started to keep their doors for tourists open throughout the year. Same is the case with Kargil as well actually. You can travel here from Leh city and will easily find a hotel to stay if you wish to. Now this can be a bit tricky. Finding a hotel in Leh is easy but not in other places like Nubra, Pangong, Moriri, Changthang etc. Out here, there is a high chance that you may not find a place to stay at all. So it would be better to book your stay in advance. Booking too will be a problem since there is no phone connectivity as well. Best choice would be to book a taxi in Leh in advance; and ask the taxi driver to make arrangements for your stay as well as per the itinerary. An even better choice in my opinion is to not plan to stay anywhere except for Leh city. Just make a day trip to other places and return to Leh by evening. More information on this is provided further in the article. Contrary to common belief, Leh City is not actually completely deserted in winter. All the government offices, hotels, Army areas, grocery shops, few hotels and restaurants remain open throughout the year. Hotel Tso Kar in Leh is where I stayed during my winter trip. They have central heating and WiFi as well and I will recommend it. Weather of Leh Ladakh in February remains to be cold, harsh and unforgiving. I am not really talking about the kind of cold that people like you and I are used to in our home cities. What you should be expecting in Ladakh at this time is the extreme side of winter season that forces even the locals out of the area. Sun may go missing for several days altogether leaving everything all wet and foggy. It is the time when you may even get frostbite if weren’t careful. And when the sun will be there in the sky, it will shine so bright that you may even get sunburn. Cold winds, freezing temperatures, blizzard, and snowfall are a common thing at this time of the year. At an average, temperatures in Leh Ladakh in February will hover between 1°C maximum during day and -10°C at night. The minimum number is just an average though because sometimes it can drop as far as -20 Degrees Celsius at nights. Now with temperature running so low, it is expected that water will freeze everywhere; and I literally mean everywhere, even in the pipes. So there will actually be no running water in the taps. Hot water will be provided to you in buckets and in limited quantity; that you will also have to use conservatively. This also means that you may have to go without a shower for a couple of days. Frankly, I am OK not taking a bath in such cold weather for sometime; but if you are someone who cannot go without it even for a single day, maybe a Ladakh trip in February is not something you should plan on. Frozen water also means that there will be no running water in toilets as well. So your morning business would have to be done squatting over a dry pit; unless you want to excrete in the open and freeze in a squatting position. This is another thing you should consider before flying to Ladakh. If this makes you uncomfortable, then don’t go. Yes, this too is a possibility. If the weather closed in and it snowed too heavy, the electric supply can get interrupted; and it can be a few days before it is restored. On a safer side, carry a power bank to keep your phone and other electronics charged. If you own a DSLR then now would be a good time to arrange for a spare battery. As I mentioned above, Ladakh does not really get completely deserted in winter season. Government offices, Army areas, few hotels and restaurants remain open and Army keeps the roads clear of snow. After you land in Leh, you will easily be able to travel to other places for sightseeing but a lot will also depend on the weather. Since the road to Kargil is open too, you can visit all the places in between like Gurudwara Patthar Sahib, Magnetic Hill, Sham Valley, Maitreya Buddha etc. Refer to the article above for a complete list of places to see here. The only time you may not be able to visit Nubra is if there was too much snow blocking Khardung La. This usually happens immediately after a snowfall but Army clears the road just as soon as they are able to; and restore connectivity. The road to Siachen runs through Nubra valley and is a very crucial one for the Army. So the valley actually remains connected to Leh town for all 12 months. Within Nubra as well, you will be able to visit all that there is to see. Also Read: How to Plan a Trip to Nubra Valley? In terms of accommodation, there may not be many hotels open here. If you want to stay in the valley for the night then you can try Habib Guest House in Hunder. I stayed here during my winter trip and will definitely recommend it. Like Nubra Valley, Pangong Lake too remains open in February. There could be a temporary closure if Chang La got blocked after a snowfall; but it will open within a day or two unless the weather was too bad. During the month of February, the lake remains frozen completely so you will actually be witnessing a white Pangong and not blue. Also Read: How to Plan a Trip to Pangong Tso? Accommodation at the lake however can be tricky. There will of course be no camp sites available at this time; so you will have to find a place to stay at Spangmik village; or Tangste which is about 30 kilometers before the lake. There is a guest house here by the name of Changla Yakmik Guest House that remains open in winter. If you were planning to go further towards Changthang Valley then Padma Guest House in Hanle is the only accommodation available. Tso Moriri is the only place that remains a bit dicey during February. The road here can get blocked after snowfall and Army don’t usually keep it cleared all the time. So it is a possibility that you arrived in Leh but could not visit Tso Moriri because there was too much snow on the road. Your driver will be the best person to tell you at that time whether or not to go. Also Read: How to Plan a Trip to Tso Moriri? There is a guest house here by the name of Goose Homestay where I stayed and would recommend it. Another place that remains open in winter is Lake view Guest House. The last known number I had for them is 01982 – 264867 in case you want to call and book in advance. Apart from this, the Hot Spring Resort at Chumathang which is on the way is also a great choice of stay. It is built just above the hot springs which kind of works as a natural heater; and keeps the place warm throughout the winter. The best way to plan this trip is to rent a private taxi. Bus service at this time is scarce and shared taxis too will be limited. Actually it is possible that you may not find public transport at all so better not depend on it. With the recent boost in tourism, a few motorcycle rental agencies have started to remain open in winter as well. So yes, you can also rent a motorcycle but please be very careful and make a sound judgement. Do not just rent a bike because you want to be adventurous. With weather that cold and snow/frost/black ice making roads slippery, this could prove to be a huge mistake and ruin your trip. Food will be very basic everywhere so you will actually have to keep your expectations low in this aspect. Do not go expecting a long list of available items on the menu. Fresh vegetables in winter are not easily available and locals tend to stock up those for a few weeks. Whatever is put on your table is going to be very simple. You can either eat at your hotel or at any of the restaurants open in town. Neha Sweets in main market in Leh remains open in winter months as well where I mostly ate. Also Read: What is the Best Itinerary if you were flying to Leh? In Leh City you may be able to find a good hotel but not in any of the other places. At places like Nubra, Pangong or Hanle, you will be staying at either simple guest houses or as paying guest. Your stay will definitely be comfortable and warm but please do not expect a five star hotel treatment. Will there be snow? Yes definitely. Will you catch a live snowfall? Yes, chances are quite high. Will there be snow all around, everywhere and all the time? No. Even in peak winter, Ladakh is not a complete whiteout. There may not be any snow at all on ground in lower areas like Leh city or Nubra Valley. That only happens when there has been a recent snowfall leaving everything covered in snow. Otherwise snow is usually available in ample towards high altitude passes. My first advice here would be to not make this trip if there is any kind of medical history involved that can turn serious. You are going to a high altitude place and that too when its freezing up there. Doing so with a serious kind of ailment is not really best of the ideas. With that being said, there are hospitals in Leh city that remain open in winter season. Apart from the hospitals, you can also approach Indian Army as well for medical assistance. Hospitals however are only limited to Leh and Kargil only. There is no medical assistance available at Nubra, Pangong or Tso Moriri. As a precaution though, please make sure that you are packing some basic medicines with you; like for cold, flu, fever, headache, stomach ache etc. With about 80% of Ladakh closed, shopping options are almost next to none. There is not much that will be on sale at this time. You may however be able to buy some winter clothing and gear like shawls, mufflers, caps etc. With weather that cold, you should not really be planning to camp anywhere in Ladakh at this time. Your accommodation at all the places should be inside cemented hotels. Camping in open is a bit risky. You may get caught in bad weather or catch cold which will very well ruin your trip. But if you do want to go camping then make sure you bring in the best quality sleeping bag to keep you warm in below 0 degrees temperatures. You can also rent the camping gear and sleeping bags in Leh city. This actually applies irrespective of your time of travel. When traveling to a place like Ladakh, you must have a few days as buffer over and above your actual travel plan. But for a winter trip, this is actually of extreme importance. There is a high possibility that you were visiting Nubra or Pangong and the weather closed in; forcing you to stay there for a couple of days till the roads were cleared. Sometimes even flights can get cancelled actually. You must then be prepared to handle it. If your stay got extended then you should be able to afford to stay back without running into any kind of problem back home. What I mean by this is to only include areas that are major tourist destinations. Do not plan on wandering towards places like Marsimik La, or other closer to border areas, or some internal routes like Shyok road. My advice would actually be to not even plan a night stay anywhere other than Leh City. You should book a hotel in Leh and keep your night stays only there. You can start in the morning, make a day trip to all the places and come back by evening. I am only saying it because it will make thing easier for you but yes, if you want to overnight at Nubra or Pangong, you can do that as well. An itinerary that I will recommend is as below. This is just a sample itinerary that you can tweak as per your own requirement; and time you have in hand. If you need my inputs to your own travel plan, you may ask in the comments section at the bottom of this page. The first thing you should be putting in your bag is a pair of good quality thermals. When I say good quality, I mean thermals that can keep you warm but are also comfortable enough to sleep in. Some heavy woolens would definitely have to be packed. You must also bring a warm, heavy and windproof jacket. Make sure that your jacket also has a hood to it to protect your face, neck and ears. Good waterproof gloves, shoes, woolen socks, cold cream, moisturizer, lip balm, sunglasses will be some of the other necessary items to pack. I have not really been on any winter treks in Ladakh myself but there are a few trails that remain open. Chadar trek is probably the best and most desired one. It can vary from 7 day to 14 days depending upon your schedule. Talk to any of the travel agents in Leh to inquire about either Chadar Trek or any other winter trails. Visit Ladakh in February – Why? In the end, let me talk about why you would want to be visiting Ladakh in the month of February. Snow is the first reason of all. Visiting Ladakh at this time guarantees that you will find plenty of snow and may even catch a live snowfall if you were lucky enough. With the recent boost in tourism, even Ladakh has started to get a bit crowded in peak tourist season. So if you want to see Ladakh the way you have heard of it; a land far away with only a handful of people around; then you should plan a trip here in Feb. Adventure however will be the greatest reason of all. Visiting Ladakh anyways means an adventure and adventure increases even further when it is a winter trip you are talking about. Harsh climate, tough living conditions, extreme weather, dangerous roads, only a handful of people around and unpredictability presents a perfect opportunity together for you to have an adventure of a lifetime. Visit Leh Ladakh in February – Why Not? Let me also talk about situation when you should not make this trip. Medical history as I mentioned above will be on top of the list. If you have any sort of illness then please do not take this chance. Or do not do it unless you have spoken to a doctor first. If you are someone who is not fond of cold then also you should give up the idea of this trip. Everything about this trip will be very basic with no fancy or five star hotel treatment. It is not your regular vacation but rather an adventurous trip so if that doesn’t sound like you, then don’t go. No running water, no shower for a couple of days, using a dry pit in the morning, harsh weather, cold wind on your face are some of the things that you will have to face and must prepare yourself for. If you can’t stand either of it, then please don’t go. The answer is a definite yes. Just keep in mind the points I mentioned above and you will have a fun and memorable trip. I hope the information provided was of help. If you have any other questions; or need any further details; please feel free to ask in the comments section below; or at our Community Forum; and I will be glad to answer. Thanks for taking the time to drop a note Sunny. I am sorry but I do not have any recommendations for travel agencies as such. Hi. Will even 5 star hotels also be providing only basic facilities . Will water n getting hot water be a problem even in 5star hotels. Power cuts will also be faced in such hotels..?? 5 star hotels may have a power back up but you will need to confirm this with them before you decide to stay. Their facilities may be a little better considering they will charge more money but clarify this first. What are hotel charges per night and taxi rent per day. It will depend on the hotel. Taxi charges in Ladakh are on basis of destination and not per day.